Who is this event for ? 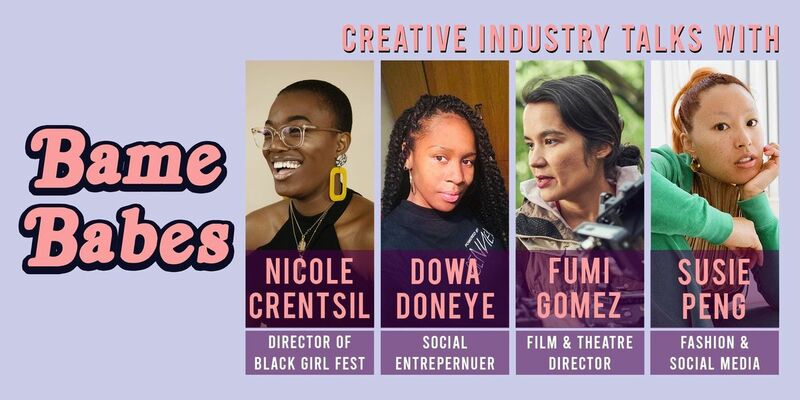 BAME BABES TALKS is an event to hear firsthand from BAME women working the creative industries, how they got there and how you can use their experience to enhace your own. BAME BABES TALKS is a space to meet like minded creatives. Feel empowered and access support, advice and guidance. An event created for Women to share their experiences and how they have navigated the creative industries. Fumi Gomez is a freelance film and theatre director. She's worked in the performing arts industry for the past decade. She is co-founder of Horatio Productions, specialised in new writing for science fiction theatre and film. She is heavily invested in theatre and film that speaks from a female, BAME, diverse, intersectional perspective, in a way that is clear, political and most importantly, entertaining. Susie Peng is a fashion e-commerce owner selling vintage clothes and accesories. A freelance producer and creative director for somehwere films. Susie also creates social media content for a heritage lottery funded project .